Now that he’s done slapping down primitive screwheads and their fictitious political tweets, actor/legend Bruce Campbell is back to doing what he does best: Mugging and self-promotion, shot through with a charming layer of humble self-mockery. Teaming up with his Ash Vs. 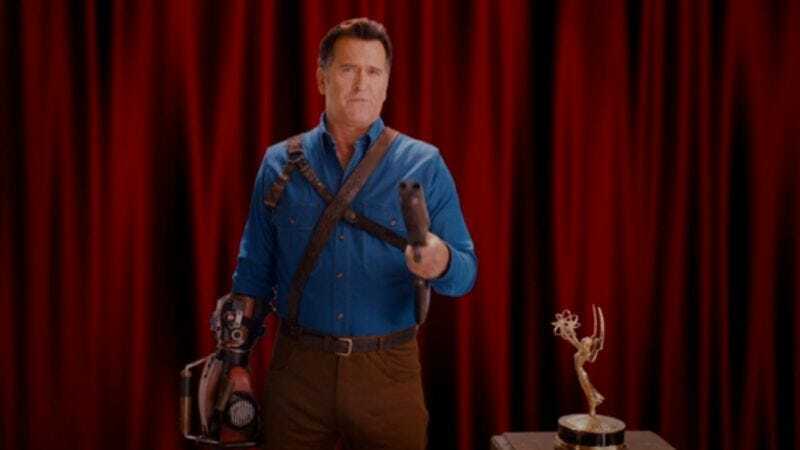 Evil Dead bosses at Starz, Campbell is making a hard press to secure a nomination for himself at next year’s Emmy’s, campaigning to be recognized as Best Lead Actor In A Comedy Series. He has a chainsaw hand! Hey, it’s Bruce Campbell. C’mon! It’s a compelling argument—especially the call to make a “terrible but fun decision”—one that’ll hopefully lead Emmy voters to do the right thing this summer and finally hail to the king.